Even though here in the Seattle area we’ve only had about 2 1/2 weeks of summer, I am aware that the end is drawing near. School shopping is in full force. Fresh canned goods are being stock piled in pantries. Even days are beginning to feel a bit shorter. But in the midst of autumn on the horizon, I feel the need to keep summer close to me for a bit longer. The following recipe is by far one of my favorites for summer and something that I make a few times each season. I hope you enjoy it as much as I do! 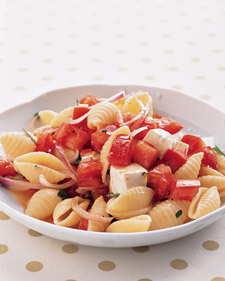 In a large bowl, toss warm pasta with tomatoes, mozzarella, onion, olive oil, basil, and garlic. Season with salt and pepper. Serve warm or chilled with some nice ciabatta bread.